Mamak Khadem is a classically trained Persian singer who has studied her art extensively in both Iran and the United States. 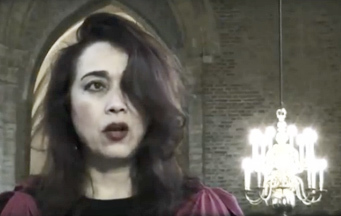 The lead singer of the cross-cultural Persian fusion ensemble Axiom of Choice, she has performed in many venues, including the Skirball Cultural Center, the Greek Theater, the Smithsonian Museum, and the House of Culture (Berlin), as well as at many festivals, including the Voices of Women Festival (Greece), and the World Festival of Sacred Music - Los Angeles. She has been a featured performer on numerous film and television scores, including those for the feature films “The Peacemaker”, “Traffic”, and “Dracula 2000,” and “The Profiler”, “Buffy the Vampire Slayer”, and “Battlestar Galactica” TV series. She has also recorded with Turkish singer Omar Faruk Tekbilek on the album Alif, with Jamshied Sharifi on A Prayer For The Soul Of Layla, and with Tulku on Season of Souls (later compiled on the Buddha-Bar series. Mamak also sang the music composed by Eve Beglarian in the production of the "Libation Bearers" directed by Lee Breuer at Patras Festival in Greece. Mamak Khadem is a wonderful singer in the Persian style, but what's really interesting about Jostojoo is its musical breadth. Iran stands at a crossroads: its people and language are proudly Indo-European, but it shares borders with Arab Iraq as well as Afghanistan. Beautiful voice, great music, full of energy and love. This new work is both professional and spiritual. Mamak not only is blessed with great voice, she is a true master of Persian traditional singing. Arrangements are outstanding and seamless. All and all fantastic and timeless album. Mamak's voice is mesmorizing. With her songs, you travel to faraway distances and find yourself at home. She is a ture artist whose zest for life is riveting and inspiring. Some Iranian friends took me to see Mamak perform in L.A., my first exposure to this kind of music. Now I'm completely hooked! I've listened to her album hundreds of times and still find myself instinctively gyrating to the rhythms while being transported to exotic lands in a hypnotic trance. I'm really looking forward to her next performance --as are my non-Iranian friends who have become new fans. to "the place where everything is music" (RUMI).I was specialy touched when I heard the Kurdish and the Balouchi songs. Also this album gave me an opportunity to get familiar with some Armenian, Turkish, and Greek melodies. Can't wait to see her in live performance. Axiom of choice is always in my car, great for night time driving. She has such a beautiful voice and the music is soothing and passionate. Do I hear Kelzmer, celtic tunes here? Interesting. Loreena McKenit did quite a bit of mixing of Celtic and middle eatern melodies and systems in the 90's. Still good.